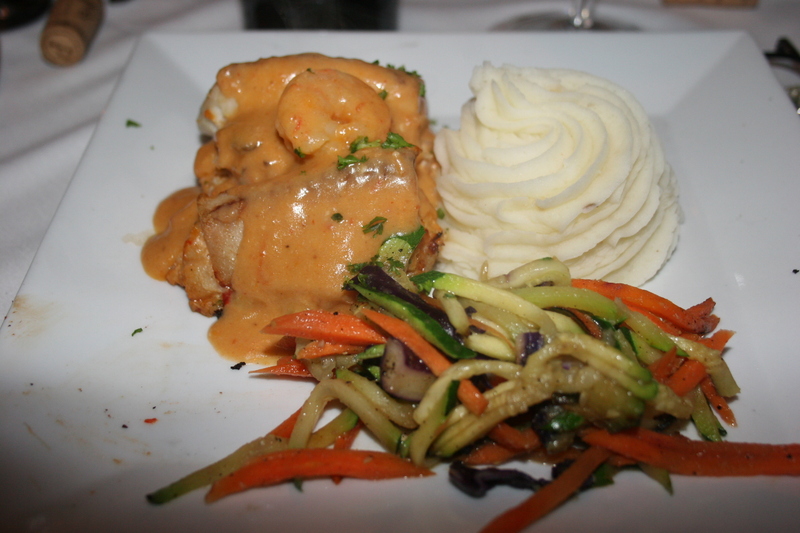 Barcelona – A European Bistro, is located in beautiful, downtown Pitman, NJ. Friends and neighbors have long lamented the dearth of suitable restaurants in Pitman which, with it’s Broadway Theatre and small town shopping, has long been a natural location for good eateries. Barcelona helps fill that need. 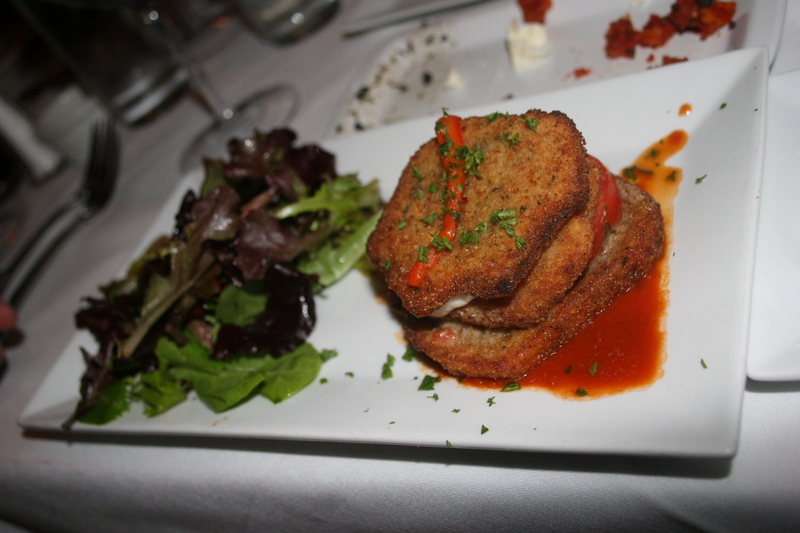 It’s a great stop for pre-theatre dining and that is exactly what we were doing there this past Saturday evening. Our friends Jerry and Sue C. gave us their tickets to “Singing in the Rain” at the Broadway Theatre and my wife Kathy and I, Joe and Carol B. and Tom and Barbara T. had a 6:15 reservation at a place I had never been before. The other two couples, being season ticket holders at the Broadway, had been to Barcelona a few times in the past. The interior is bright and cheery and the tables are nicely spaced to afford diners ample privacy. Both Joe and I had brought with us Malbecs from Argentina. 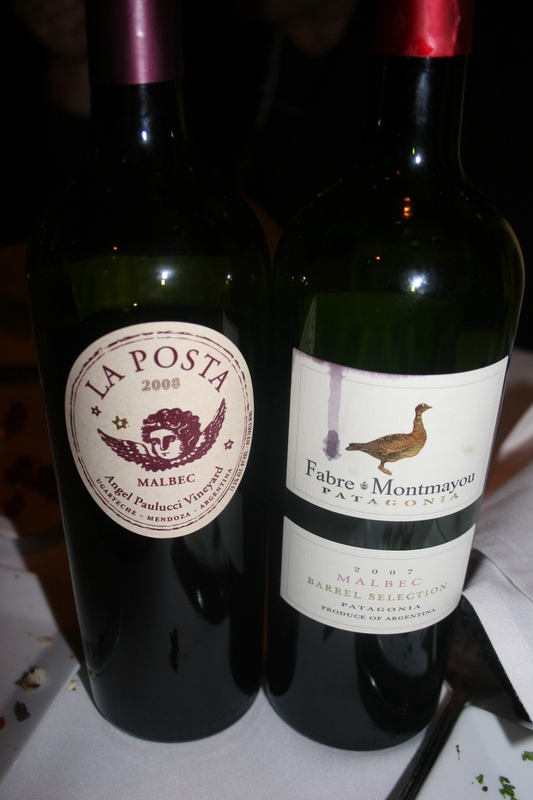 Joe had the 2008 La Posta “Angel Paulucci Vineyard”, my wife Kathy’s new “favorite wine”, while I had one of my perennial favs, the 2007 Fabre – Montmayou, Barrel Selection, from Patagonia. Both seemed naturals for the spices associated with a Spanish restaurant. The menu itself has a wide variety of interesting items and they had a few specials for the evening to add to the wealth of choices. Barcelona also offers an extensive tapas selection if you are in the mood for trying lots of small plates. 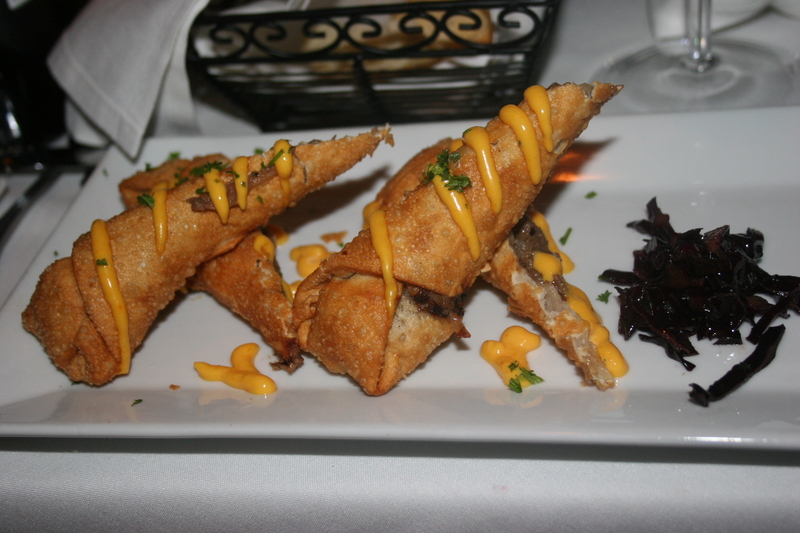 I chose an appetizer from the “Specials” list because it sounded different and interesting, it was Mark’s Spring Rolls, a crisp spring roll filled with steak, drizzled with cheese and served with carmelized red onions . The dish was presented with four nice size offerings of tender steak, drizzled with the cheese sauce (think mini-cheese steak in a pastry shell). It was very filling and could almost have served as a meal. Some of the women chose the Soup du Jour which was a Sweet Potato soup. Kathy and Carol both split an eggplant appetizer. It should be pointed out that our friend Carol B. is, by nature, a very sweet, charming and fun to be with person. She has, however, little patience with flaws in food or service when dining out, and is not hesitant to point them out when they occur. When both her soup and her appetizer arrived at the same time she was quick to point out to our server that an error had been made. The situation was quickly rectified without bodily injury to anyone and our meal continued in peace and harmony. 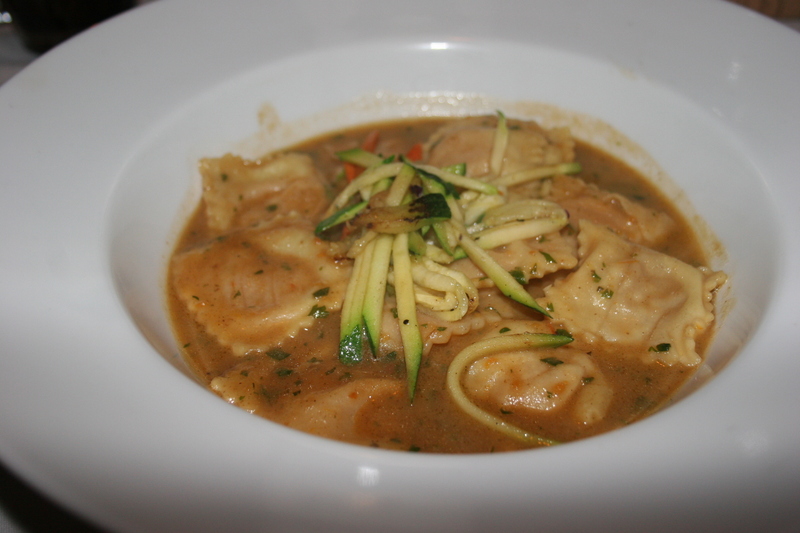 All three of the women ordered the Sweet Potato Ravioli in Sage Butter sauce. The pasta was nicely cooked and the filling flavorful. It should be pointed out that all of us had our eyes on our watches as we waited quite some time for the entrees to arrive and the starting time for our theatre date drew closer. 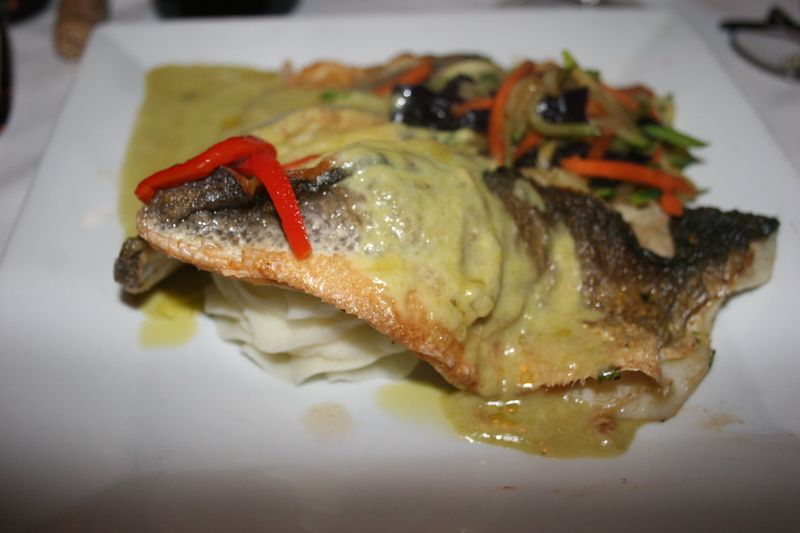 Joe had chosen the Baked Bronzino from the specials menu and Tom and I both ordered the Tilapia Rellena, Stuffed Tilapia with shrimp, scallops and crab meat in a shrimp sauce . We were really rushing toward the end to finish in time for the show but I would be remiss in not pointing out that the chef came to our table to apologize for the delay confessing that he had burned one of the tilapias and that was the reason for the slow service. He was nice enough to comp all of our desserts, and since we didn’t have time to have them there, we had them boxed for consumption after the show back at our house. Overall, the food at Barcelona was pretty good, the experience was a little haggard, but I would say they certainly deserve another chance and the place shows the potential to be a nice spot for a weekend dinner in a town that desperately needs quality dining places.